Insulin signalling is uniquely required for storing energy as fat in humans. While de novo synthesis of fatty acids and triacylglycerol occurs mostly in liver, adipose tissue is the primary site for triacylglycerol storage. Insulin signalling mechanisms in adipose tissue that stimulate hydrolysis of circulating triacylglycerol, uptake of the released fatty acids and their conversion to triacylglycerol are poorly understood. New findings include (1) activation of DNA-dependent protein kinase to stimulate upstream stimulatory factor (USF)1/USF2 heterodimers, enhancing the lipogenic transcription factor sterol regulatory element binding protein 1c (SREBP1c); (2) stimulation of fatty acid synthase through AMP kinase modulation; (3) mobilisation of lipid droplet proteins to promote retention of triacylglycerol; and (4) upregulation of a novel carbohydrate response element binding protein β isoform that potently stimulates transcription of lipogenic enzymes. Additionally, insulin signalling through mammalian target of rapamycin to activate transcription and processing of SREBP1c described in liver may apply to adipose tissue. Paradoxically, insulin resistance in obesity and type 2 diabetes is associated with increased triacylglycerol synthesis in liver, while it is decreased in adipose tissue. This and other mysteries about insulin signalling and insulin resistance in adipose tissue make this topic especially fertile for future research. Insulin signalling and its impairment in obesity and type 2 diabetes is a vast field that commands the full attention of many hundreds of laboratories worldwide. Scientific output has been extremely prolific, making it unlikely that any investigator has actually read all the relevant literature, which includes 25,082 publications listed in PubMed under the topic ‘insulin signaling’ and 67,013 papers listed under the heading ‘insulin resistance’. Review articles that discuss insulin resistance number 15,711, as of August 2012. Also, for many of the most interesting findings, separating fact from fiction will take years for confirmatory studies to be reported and controversies resolved. These realities create a huge challenge for scientists trying to understand insulin signalling mechanisms and their dysfunctions in metabolic disease, especially for those who are now just entering the field. One approach to this scientific challenge is to focus on a small but critical corner of the puzzle. Such a niche area in the study of insulin signalling is lipid storage, dramatically highlighted in the images of the first diabetic patients treated with insulin in 1922, who were transformed from emaciated to plump within a few weeks . At the cellular and molecular levels, insulin’s actions indeed coordinately enhance the synthesis of triacylglycerol, the central currency of stored lipid in humans. While hepatocytes are a principal site of de novo lipogenesis (synthesis of fatty acid) as well as overall lipogenesis (esterification of fatty acid with glycerol 3-phosphate to form triacylglycerol) , adipocytes are the principal site of triacylglycerol storage in healthy individuals . Importantly, deficits in adipocyte capacity for increasing triacylglycerol deposition, for example in human lipodystrophies and obesity, contribute to systemic lipid overload and ‘lipotoxicity’, which in turn are thought to disrupt whole body glucose tolerance . Thus, we focus in this review on insulin signalling and its dysfunctions specifically in relation to adipocyte triacylglycerol sequestration, recognising this topic's broader implications for understanding the pathophysiology of obesity and type 2 diabetes. Increased circulating fatty acids and triacylglycerol are strongly correlated with impaired insulin signalling and glucose intolerance in obesity and type 2 diabetes [5, 6]. Indeed, dysfunctional lipid metabolism has been highlighted as the primary defect in the aetiology of metabolic disease . Furthermore, the accumulation of fat in non-adipose tissue (e.g. liver and muscle) has been described as a strong predictor of type 2 diabetes mellitus, although the molecular mechanisms by which lipids contribute to insulin resistance in these tissues is still unclear (for review, see [8, 9]). Systemic insulin resistance includes impaired suppression of hepatic gluconeogenesis by insulin and attenuated insulin stimulation of skeletal muscle and adipocyte glucose uptake. Inducing hypertriacylglycerolaemia or high circulating NEFA levels in human volunteers using lipid emulsion infusions can cause systemic insulin resistance as measured by hyperinsulinaemic clamps [10, 11, 12, 13]. In addition, incubating cells with high concentrations of lipids, primarily palmitate, demonstrates negative effects of increased circulating lipids on insulin action in peripheral tissues [14, 15, 16]. However, a contrary viewpoint is that circulating NEFA levels are minimally elevated in human obesity, and more work is required in this area . Evidence that adipose triacylglycerol storage capacity is a critical factor in elevated circulating triacylglycerol and insulin resistance is provided by experimentally promoting adipogenesis in mice [18, 19], which improves systemic insulin sensitivity. This likely occurs in part through sequestration of lipid away from other insulin target tissues, as well as by providing beneficial adipokines [20, 21, 22]. Specifically promoting adipocyte triacylglycerol synthesis in transgenic mice through increasing levels of critical lipogenic enzymes in adipocytes, exemplified by acyl-CoA:diacylglycerol acyltransferase , indeed produces increased adiposity but also improves glucose tolerance. 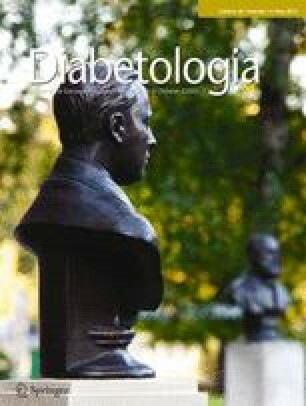 Furthermore, promoting adipose glucose uptake and lipogenesis by transgenic enhancement of glucose transporter 4 (GLUT4) levels reverses diabetes in mice [21, 23]. Insulin signalling enhances lipid storage in adipocytes by both stimulating triacylglycerol synthesis and inhibiting its breakdown. Triacylglycerol is stored in lipid droplets, which also contain lipid droplet proteins, including perilipin 1, adipophilin/adipocyte differentiation-related protein, tail-interacting protein of 47 kDa and fat-specific protein of 27 kDa (FSP27)/Cidec [24, 25, 26, 27]. Active hydrolysis of stored triacylglycerol into its constituent fatty acids and glycerol occurs in starvation and exercise, through the actions of lipases and their regulators localised on the droplets (Fig. 1). Three key lipases control lipolysis: adipose tissue triglyceride lipase (ATGL) primarily catalyses triacylglycerol into diacylglycerol (DAG), hormone-sensitive lipase (HSL) has a higher affinity toward DAG than triacylglycerol, and monoacylglycerol lipase completes the last step in the process [28, 29, 30, 31]. Two lipolytic pathways are highlighted in Fig. 1. The most studied pathway involves β-adrenergic stimulation by catecholamines, leading to increased cAMP levels and protein kinase A (PKA) activation, which increases access of lipases to the triacylglycerol droplet. In the fed state, perilipin binds the ATGL co-activator known as comparative gene identification-58 (CGI-58). Upon activation, PKA phosphorylates perilipin 1, releasing CGI-58 to activate ATGL [32, 33]. In contrast, HSL activation arises through direct phosphorylation by PKA on multiple residues, inducing HSL translocation to the lipid droplet surface via interaction with the NH2-terminal of phosphorylated perilipin-1. This coordinated activation of both HSL and ATGL results in a powerful lipolytic stimulation [34, 35]. A second lipolytic pathway depicted in Fig. 1 is stimulated by natriuretic peptide (NP). A recent study demonstrated that this pathway is activated following cold exposure, increasing the thermogenic activity of white adipose tissue via a p38 mitogen-activated protein kinase (MAPK)-dependent pathway . Binding of NPs to the active A isoform of the NP receptor results in increased cGMP levels and activation of protein kinase G (PKG), which phosphorylates the same targets as PKA, namely HSL and perilipin 1, independently of β-adrenergic stimulation [37, 38, 39]. Its role in enhancing adipose tissue thermogenesis, together with the fact that it is downregulated in obesity [36, 40], makes this NP receptor A signalling pathway a potential therapeutic target. Insulin’s potent inhibition of lipolysis not only favours lipid storage but also markedly decreases circulating fatty acid levels. Insulin signalling is initiated through its receptor tyrosine kinase, which phosphorylates insulin receptor proteins (IRS) leading to phosphatidylinositol 3-kinase activation (PI3K), phosphatidylinositol 3,4,5-triphosphate generation and Akt activation (see [41, 42] for comprehensive reviews). This signalling markedly inhibits PKA- but not PKG-mediated lipolysis. At least four sites of negative regulation by insulin signalling can be identified on the β-adrenergic receptor-mediated lipolytic pathway (Fig. 1). First, insulin inhibits lipolysis through phosphorylation of adipose-specific phospholipase A2, which via arachidonic acid production increases prostaglandin E2 levels and in a paracrine/autocrine manner reduces cAMP levels through inhibition of adenylate cyclase [43, 44]. The exact mechanism of this pathway remains to be elucidated. Second, activation of Akt phosphorylates and activates phosphodiesterase, thereby reducing cAMP levels and PKA activity [45, 46, 47]. Third, the downstream target of Akt, mammalian target of rapamycin complex 1 (mTORC1), attenuates β-adrenergic stimulated lipolysis through inhibiting ATGL mRNA levels, while mTORC1 itself is inhibited by PKA . Fourth, insulin upregulates the levels of the lipid droplet protein FSP27 through increasing its transcription, which dampens lipolysis [27, 49]. Thus, insulin action to inhibit lipolysis in this multifaceted mode provides a powerful restraint on the release of fatty acids from triacylglycerol within adipocyte lipid droplets. The actions of insulin to stimulate synthesis of triacylglycerol in adipocytes can be divided into two categories based on the time frame of their stimulatory effects. A summary of rapid insulin effects that occur within minutes to an hour or two is presented in Fig. 2. The major acute insulin effect is a several-fold stimulation of glucose transport into cells, mediated by increased translocation of GLUT4 to the plasma membrane through signalling by PI3K [50, 51, 52, 53, 54]. In adipocytes, this stimulation of glucose entry (Fig. 2) acts in concert with the process of glyceroneogenesis,  to provide intracellular substrate for synthesis of glycerol 3-phosphate needed for esterification of fatty acids into triacylglycerol. It is important to note that the process of glyceroneogenesis, whereby pyruvate is converted to glycerol 3-phosphate, can be the major contributor to this esterification step as well, and is discussed in detail elsewhere . The signals downstream of insulin-stimulated PI3K may include atypical protein kinase C (PKC) isoforms [56, 57], but it seems that the predominant signals derive from Akt activation [58, 59]. The RabGAP (Rab GTPase-activating protein) AS160/ TCB1D4 has been identified as an Akt substrate that regulates GLUT4 translocation [60, 61, 62], but studies on manipulating AS160 levels suggest that other, as yet unidentified, Akt substrates are also involved [63, 64]. In spite of decades of work, the detailed mechanisms of insulin stimulation of glucose transport remain largely unresolved. Two pathways stimulated by insulin contribute to the pool of fatty acids that is esterified into triacylglycerol in adipocytes: fatty acid uptake from circulating triacylglycerol and de novo fatty acid synthesis. The former is the major pathway and is mediated in part through insulin stimulation of mRNA and protein levels of lipoprotein lipase (LPL), as well as the activity of LPL, which hydrolyses circulating triacylglycerols in lipoproteins into glycerol and fatty acids (Fig. 2) [65, 66]. Adipocyte-derived LPL is required for efficient fatty acid uptake and storage , and insulin infusion in humans increases adipose tissue LPL activity within a few hours [68, 69]. LPL activity is modulated through both post-transcriptional and post-translational mechanisms [66, 70]. In isolated rat adipocytes, inhibition of PI3K completely blocks the stimulation of LPL activity by insulin, while inhibition of mTOR partially inhibits insulin-stimulated LPL activity . Fatty acids enter the adipocyte by diffusion and by capture mediated by fatty acid transporter (FAT/CD36) and fatty acid transporter protein 1 (FATP1), which catalyses the conversion of fatty acids into fatty acyl-CoA . Wu et al showed that insulin-stimulated fatty acid uptake is completely abolished in FATP1-null adipocytes and greatly reduced in the skeletal muscle of FATP1-knockout animals, while basal fatty acid uptake by both tissues was unaffected . Insulin appears to increase fatty acid uptake in adipocytes by stimulating the translocation of FATP1 from intracellular vesicles to the plasma membrane . Blocking PI3K or the MAPK pathway inhibits insulin-stimulated translocation of FATP1 to the cell surface . As mentioned above, insulin also increases the pool of adipocyte fatty acids for esterification through its acute stimulation of de novo lipogenesis, which mostly occurs in the liver and to a smaller extent in adipocytes. The inactivation by phosphorylation of a key enzyme in fatty acid synthesis, acetyl-CoA carboxylase (ACC), by AMP-activated protein kinase (AMPK) has been well established in isolated adipocytes [74, 75, 76]. Berggreen et al reported that, in adipocytes, insulin-stimulated Akt might regulate ACC by direct phosphorylation of AMPK, resulting in AMPK inhibition . This in turn would lead to the dephosphorylation and activation of ACC, increasing malonyl CoA production and de novo lipogenesis (Fig. 2). Interestingly, fatty acid synthase (FAS), the last enzyme in the synthesis of fatty acids [78, 79], may also be regulated by AMPK under certain conditions . Insulin might acutely stimulate triacylglycerol synthesis or retention in adipocytes through regulation of S3-12, an adipocyte-specific lipid droplet protein . The formation of S3-12-coated lipid droplets in adipocytes apparently requires active triacylglycerol synthesis, which is insulin-dependent though PI3K activation. Treatment of 3T3-L1 adipocytes for 30 min with insulin was sufficient to redistribute S3-12 protein to lipid droplets , whereas a period of about 4 h was required for the upregulation of the lipid droplet protein FSP27 level by insulin . Insulin may also facilitate the reformation of macro lipid droplets during recovery from lipolysis stimulation . Although long-term insulin stimulation of lipogenesis involves major increases in the expression of genes encoding hepatic lipogenic enzymes [83, 84, 85, 86], as depicted in Fig. 3 within the orange background, remarkably little is known about these mechanisms in adipocytes. Sterol regulatory element binding protein (SREBP) was originally identified as a transcription factor that binds to sterol regulatory elements in the promoter of the genes required for cholesterol regulation and adipocyte differentiation [87, 88]. Nuclear entry of SREBP requires proteolytic cleavage of the cytoplasmic N-terminal domain [89, 90], which is stimulated by insulin in hepatocytes [88, 89]. Of the three members of the SREBP family—SREBP-1a, SREBP-1c and SREBP-2—SREBP-1c is abundant in lipogenic tissues, and its transcription is induced by insulin . SREBP-1c can stimulate the transcription of Glut4  and many lipogenic genes, including, Fas, Lpl, Acc, Elovl6, Acl, Gpat, Dgat, Scd-1, and Scd-2 [87, 93], and strongly promotes de novo lipogenesis in liver. However, adipose-specific knockout of this factor had little or no phenotype in mice [94, 95]. Deficiency of SREBP-1c in mouse tissues can be accompanied by an elevation of SREBP-2 levels, which may be partially functionally redundant, so interpretation of these results is unclear and more work is needed to resolve this issue. Insulin signalling to increase both SREBP-1c levels and processing is robust in liver (orange background in Fig. 3). Mechanisms may include a role of atypical PKC since a constitutively active PKCλ/ζ in liver upregulated SREBP-1c while an active Akt construct did not . These data complement previously published studies on mouse knockouts indicating that atypical PKC activity is necessary for insulin stimulation of SREBP-1c levels . In contrast, hepatic SREBP1c processing appears to be controlled by insulin through the Akt–mTOR pathway [98, 99, 100]. It was reported that mTORC1 mediates insulin-stimulated processing of SREBP-1c through its substrate protein kinase S6K, while the insulin signalling to stimulate SREBP-1c levels is less clear [101, 102]. Lipin-1, a phosphatidic acid phosphatase and a transcriptional co-activator, is a direct substrate of mTORC1 and a negative regulator of nuclear SREBP activity . In mouse liver, nuclear transport of SREBP may be regulated by Akt signalling through control of INSIG-2 levels [100, 103]. The MAPK pathways, c-Jun N-terminal kinase, extracellular-signal-regulated kinase and p38 MAPK have been shown to phosphorylate SREBP-1a in liver [104, 105], and mutation of the SREBP-1a sites phosphorylated by the MAPKs in vivo abolished the transcriptional activation by SREBP1-a and protected mice from fatty liver and visceral obesity (not shown in Fig. 3) . Thus, insulin acts at multiple regulatory steps to control the activity and levels of SREBPs in hepatocytes but, remarkably, none of these pathways has yet been carefully evaluated in adipocytes. Two pathways that have been demonstrated to regulate expression of lipogenic genes downstream of insulin signalling in adipocytes are also depicted in Fig. 3 within the yellow background section. First, insulin regulates the binding of heterodimers of basic helix–loop–helix leucine zipper transcription factors upstream stimulatory factor-1 and -2 (USF1/USF2) to the Fas promoter in cultured adipocytes . Consistent with these findings, USF null mice exhibit significantly impaired lipogenic gene induction in liver . USF and SREBP-1c also interact in vitro and in vivo, while co-transfection of USF and SREBP-1c result in highly synergistic activation of the Fas promoter . Insulin signalling through protein phosphatase-1 has been proposed to dephosphorylate and activate the protein kinase DNA-dependent protein kinase (DNA-PK), which in turn phosphorylates USF1 and increases transcriptional activation of FAS and de novo lipogenesis . In DNA-PK-deficient severe combined immunodeficiency (SCID) mice, feeding-induced USF1 and FAS activation are impaired, resulting in decreased circulating triacylglycerol levels and reduced adiposity . A second insulin-regulated lipogenic transcription factor in adipocytes is the carbohydrate response element-binding protein (ChREBP), also known to enhance lipogenesis in liver. Insulin-stimulated glucose uptake in adipocytes activates ChREBP, which upregulates de novo lipogenesis in adipose tissue . The target genes of ChREBP are involved in glycolysis, lipogenesis and gluconeogenesis [109, 110, 111, 112]. During fasting, PKA and AMPK phosphorylate and inhibit ChREBP function . Intermediates of glucose metabolism (xylulose 5-phosphate or glucose 6-phosphate) may be essential for both ChREBP nuclear translocation and transcriptional activity in response to glucose in liver cells [113, 114]. ChREBP −/− (also known as Mlxipl) mice display significantly reduced adipose tissue and are insulin resistant ; this is potentially due to dysfunctional adipocyte lipogenesis. Interestingly, glucose-induced ChREBPα transcriptional activity increases the levels of a novel isoform, ChREBPβ (Fig. 3), which plays an even more active role in the regulation of lipogenic genes in adipose tissue . While transgenic mice producing high levels of GLUT4 in adipose tissue improves insulin sensitivity, elevating adipocyte GLUT4 levels in ChREBP −/− mice does not . These data are consistent with the hypothesis that adipocyte lipogenesis stimulated by insulin is important in regulating whole body metabolism, perhaps by generating beneficial lipids that can affect whole body insulin sensitivity . That insulin signalling is important for adipocyte lipogenesis is reinforced by data showing that adipose-specific knockout of the insulin receptor leads to lower adipose mass [116, 117]. Expansion of fat mass in obesity is accompanied by infiltration of cells of innate and adaptive immunity, including macrophages, T cells, B cells, natural killer T cells, neutrophils, eosinophils and mast cells [118, 119, 120, 121, 122, 123]. Macrophages are the most abundant immune cell population in adipose tissue in obesity , and are the main source of pro-inflammatory molecules (e.g. TNF-α, IL1β) secreted in adipose tissue in the obese state [124, 125]. Macrophages may be attracted into adipose tissue by increased fatty acid release from either viable or dying adipocytes in obesity [126, 127], which may shift their phenotype from M2 towards the M1 pro-inflammatory phenotype . Adipose tissue macrophages can also accumulate lipids and become ‘foam cell like-cells’ , which may complement adipocyte lipid sequestration in adipose tissue. While much of the relevant literature suggests macrophages in adipose tissue inhibit adipose function [125, 130], some data indicate a beneficial role, for example, in attenuating lipolysis . T lymphocytes represent the second most abundant immune cell population in adipose tissue and might accelerate adipose tissue macrophage recruitment and activation [131, 132]. Levels of pro-inflammatory CD8+ and IFNγ+ T helper (Th) type 1 cells appear to increase with obesity, while levels of anti-inflammatory IL4+Th2 and regulatory T cells appear to decrease in adipose tissue from obese mice and humans [133, 134, 135, 136, 137]. Thus, T cells may mediate inhibitory effects on insulin action and lipogenic genes [135, 136]. Th17 cells producing IL17 may impair adipose tissue metabolism via inhibition of adipogenesis and decreased glucose uptake [137, 138]. IL17-deficient mice gained weight but sustained glucose tolerance under high-fat diet (HFD) conditions . In addition, natural killer T lymphocytes in adipose tissue are activated by binding to lipids or glycolipids associated with the protein CD1d. Although these and other immune cells represent a very low percentage of the adipose tissue total, a role in obesity-induced insulin resistance is suggested by their experimental depletion in mice [119, 121, 122, 140]. Macrophages and lymphocytes can also become insulin resistant . Indeed, depletion of insulin receptor in myeloid cells protected mice from HFD-induced insulin resistance and adipose tissue inflammation [142, 143]. Table 1 summarises the major factors produced by infiltrating immune cells in adipose tissue of obese rodents and humans and their reported effects on adipose tissue metabolism and insulin signalling. These include a broad range of pro-inflammatory cytokines, including TNF-α, IL1β, IL6, and IFNγ, whose negative effect on insulin signalling is indicated in several studies using knockout animals and other approaches [125, 144, 145]. Furthermore, TNF-α injection or adipocyte-specific production of the active transmembrane form of TNF-α exacerbates systemic and local insulin resistance, respectively [146, 147, 148]. IFNγ, produced by Th1 and CD8+ lymphocytes, also downregulates insulin signalling and adipogenesis, while increasing lipolysis . Moreover, depletion of IFNγ protects mice from HFD-induced insulin resistance . IL17 secreted by Th17 cells in adipose tissue also negatively regulates adipocyte lipid metabolism . The production of inflammatory lipid mediators such as 12/15-lipoxygenase products (leukotrienes, hydroxyeicosatetraenoic acids) may add to the detrimental effect on lipid metabolism in adipocytes by inducing the secretion of pro-inflammatory cytokines [151, 152]. Studies in humans and rodents continue to reveal novel inflammatory molecules from the chemokine or interleukin families that influence adipose tissue insulin signalling and lipid storage, exemplified by CCL7, CXCL5, IL7 and IL33 [153, 154, 155]. Anti-inflammatory cytokines IL4, IL10 and IL1 receptor antagonist (IL1Ra), which blunt the actions of pro-inflammatory cytokines on insulin signalling can also be measured in adipose tissue of obese individuals [128, 156, 157, 158]. For example, IL10 inhibits TNF-α production in macrophages , while transgenic mice producing elevated levels of IL10 show improved insulin sensitivity under HFD conditions . Recent studies suggest that IL4 enhances insulin action in adipose tissue, promoting activation of Akt and inhibition of glycogen synthase kinase-3β, attenuating adipose tissue inflammation [156, 160]. A key point from these studies is that immune cells can secrete both beneficial and deleterious factors within adipose depots, and the overall effect under a given physiological condition represents the integration of the effects of these multiple factors in real time. Prior to discoveries starting in the 1980s that uncovered the molecules of insulin signalling, the problem of insulin resistance was viewed as simply whether obesity mostly impaired insulin binding to its receptor vs ‘post-receptor’ signalling events. Insulin binding to adipocytes was indeed found to be inhibited in obesity, reflecting a decrease in the number of adipocyte surface receptors [161, 162] following induction of receptor endocytosis in response to insulin binding [163, 164]. However, the remaining receptors were calculated to be sufficient to mediate a full response at high insulin concentrations, which is at odds with the greatly decreased maximum response of lipogenesis that was observed [165, 166]. We now know that tyrosine phosphorylation of IRS proteins and activation of Akt2, the major insulin signalling pathway leading to glucose transport stimulation [53, 58], are also blunted in adipocytes from obese mice [167, 168] and obese, insulin-resistant humans [169, 170, 171]. Mechanisms for this impaired signalling could include inhibition of IRS function by the negative feedback loop from S6K  and inhibition of mTORC2-mediated Akt2 phosphorylation and activation, also through negative regulation by S6K  (Fig. 1). This concept is consistent with the hypothesis that the hyperinsulinaemia associated with obesity may actually be the cause, rather than simply the consequence, of insulin resistance via such feedback inhibition . Other major candidates for obesity-mediated attenuation of insulin signalling to Akt2 in adipocytes in obesity include (1) factors secreted from immune cells in adipose tissue, as described in the section above; (2) factors secreted from endothelial cells [174, 175]; (3) factors from neuronal innervation of adipose tissue [176, 177, 178]; and (4) increased influx of fatty acids into adipocytes, particularly palmitate [179, 180]. It should be noted that insulin itself may modulate the production of cytokines [142, 181, 182, 183, 184, 185, 186]. Moreover, hyperinsulinaemic clamp conditions in humans cause increased cytokine secretion by adipose tissue [187, 188]. Thus, hyperinsulinaemia may act synergistically with adipose tissue immune cells in producing insulin resistance. The potential mechanisms for inhibition of insulin signalling to Akt by the above factors have been extensively reviewed [189, 190]. Much experimental emphasis has been placed on Ser/Thr phosphorylation of IRS proteins by various protein kinases activated by the factors listed above, leading to inhibition of IRS tyrosine phosphorylation and its signalling through PI3K . However, an underappreciated aspect of insulin resistance in adipose tissue is the fact that inhibition of insulin receptor signalling to Akt is not sufficient to explain the degree to which insulin-stimulated lipogenesis is suppressed in adipocytes under physiological glucose concentrations [192, 193, 194, 195]. Stimulated Akt activity is in large excess over that needed to fully upregulate glucose transport in adipocytes, and even large inhibitions of its activity, as occurs in obesity, are unlikely to fully account for the great diminutions of acute glucose conversion to triacylglycerol observed . Thus, a key concept is that attenuation of the upstream insulin signalling pathway to Akt in obesity is only one contributor, and possibly a minor one, to what is measured as resistance of lipogenesis to insulin in adipocytes. It is well established that, in human obesity, adipocyte enzymes involved in fatty acid esterification and de novo fatty acid synthesis pathways are markedly reduced . These include diacylglycerol acyltransferase in the former pathway and ATP citrate lyase, ACC and FAS in the latter . The decreased level of lipogenic enzymes is also observed in most rodent models of obesity [198, 199]. Furthermore, it has been shown that large adipocytes from old obese rats exhibit higher rates of glucose transport per cell than small adipocytes from lean animals, even though insulin-stimulated conversion of radiolabelled glucose to triacylglycerol, glycerol and fatty acids is completely blocked in the former . Taken together, these data indicate that the uptake of glucose into the adipocyte may not be the major rate-limiting step in obesity but, rather, the enzymatic capacity to convert it to triacylglycerol is limited. Thus, in this sense, the term ‘insulin resistance’ may be a misnomer in that the major physiological impairment is in the end target of insulin action (lipogenic enzyme deficit) rather than solely in the initial insulin signalling pathway. It is confounding that hepatic lipogenesis is greatly enhanced in response to hyperinsulinaemia in obesity, while adipocyte lipogenic capacity is attenuated under these same conditions. One explanation for the increased hepatic lipogenesis in obesity appears to be activation of mTORC1 by the excess nutrient amino acids, causing stimulation of one of its known downstream targets, the lipogenic transcription factor SREBP1 [98, 99, 100]. In contrast, SREBP1 abundance and processing to its active, truncated form in adipocytes is decreased in obesity [198, 199, 200, 201, 202], even though mTOR and S6K activities are apparently actually increased in the adipose tissue of obese mice . One possible answer to this paradox relates to the selective negative influence on lipogenesis of certain immune cell factors and cytokines elevated in adipose tissue in obesity (Fig. 4). In obesity, immune cell infiltration in adipose tissue is more severe than that observed in liver [203, 204]. Strikingly, TNF-α greatly decreases adipose tissue levels of peroxisome proliferator-activated receptor γ (PPARγ) and its target SREBP1 [191, 202, 205], while it increases SREBP1 levels and processing in liver through mechanisms independent of PPARγ [206, 207]. The negative regulation of PPARγ in adipocytes by TNF-α appears to include decreases in PPARγ transcription, PPARγ mRNA stability and protein turnover [191, 208, 209]. Phosphorylation of PPARγ by protein kinases upregulated in obesity may be part of this inhibitory pattern . PPARγ, in turn, stimulates transcription and activation of SREBP1c, as well as acting directly on the promoters of many genes encoding lipogenic enzymes and factors [211, 212, 213]. The latter include lipid droplet proteins that help to sequester triacylglycerol in the droplets, protected from lipolytic enzymes [214, 215, 216]. Other cytokines such as IL1, which are released by macrophages in adipose tissue of obese individuals [124, 217], mediate similar attenuations of PPARγ activity or levels . Additionally, since insulin signalling through Akt and mTORC1 causes processing and activation of SREBP1c [98, 99, 100] (Fig. 3), the attenuated activation of Akt in obesity may contribute to decreased SREBP1c activity. It is remarkable that key experiments have not yet been performed to verify even the most popular hypotheses related to adipose dysfunction in obesity. For example, testing the concept that adipose inflammation by immune cells is a cause of systemic glucose intolerance would require immune cells to be experimentally depleted in adipose tissue while being maintained in other tissues. This critical experiment is a technically difficult one, and has not been accomplished to date. Furthermore, several anti-inflammatory strategies have been tested in metabolic disease with little success [218, 219, 220], indicating more research is necessary to unravel the role of adipose tissue inflammation in diabetes. Another major regulatory pathway of triacylglycerol synthesis involves the ability of glucose to increase the activity of ChREBPα, which promotes the expression of lipogenic genes . Similar to SREBP1c, hepatic ChREBPα levels are increased in obesity, while adipocyte ChREBPα is decreased [221, 222, 223]. In adipose tissue, unlike liver, insulin stimulates glucose uptake thus enhancing ChREBPα function. Levels of the GLUT4 protein itself are substantially decreased in adipocytes of obese mice and humans [224, 225]. Recent work revealed that ChREBPβ levels are increased by ChREBPα, and is even more potent in stimulating transcription of lipogenic genes . Adipose-specific depletion of GLUT4 decreases abundance of ChREBPα and ChREBPβ, while increased GLUT4 elevates their levels , indicating that the deficit in GLUT4 in obesity may contribute to the observed downregulation of these lipogenic factors. Furthermore, ChREBPα is also a downstream target of PPARγ , which is often decreased in adipocytes in obesity as discussed above. Taken together, these results indicate that dysfunctions in the ChREBP pathway contribute to adipose lipogenic deficiency in obesity. Since the transcription factors SREBP1c and ChREBP, along with the many genes that encode lipogenic enzymes themselves, are all downstream of PPARγ, direct obstruction of this master regulator in obesity is expected to decrease adipocyte lipogenesis capacity (Fig. 4). Such effects of PPARγ inhibition are further magnified by the simultaneous disruption of downstream feed-forward cycles. For example, the downstream target enzyme FAS catalyses synthesis of palmitate, which can apparently be converted to derivatives that act as PPARγ ligands [226, 227, 228]. Thus, decrements in FAS due to PPARγ attenuation, reduces the extent to which the remaining PPARγ can be activated. Furthermore, PPARγ upregulates elements of the insulin signalling pathway such as IRS-1 [229, 230, 231], suggesting that suppression of the upstream insulin signalling pathway to Akt in obesity is also in part secondary to PPARγ inhibition in obesity. The role of adipose tissue as the primary depot for robust triacylglycerol storage in humans appears to be an important factor in preventing systemic insulin resistance and diabetes in response to obesity. Insulin signalling maintains this high capacity for triacylglycerol synthesis and storage in adipose tissue in healthy humans, but chronic hyperinsulinaemia, increased cytokines and other abnormal secretions from cells within adipose tissue are among the dysfunctions in obesity that may contribute to a decrease in this capacity. Thus, to fully understand the relationships between adipose tissue function and whole body glucose tolerance, it is crucial to unravel the underlying mechanisms of insulin signalling, insulin resistance and control of lipogenesis in adipose. Two basic key questions among many others remain unanswered to date: What are the signals that downregulate adipose lipogenic transcription factors and lipogenic enzymes in obesity? Do the cytokines released in adipose tissue by immune cells in obesity contribute to the downregulation of adipocyte lipogenesis in vivo? Finding truly innovative approaches to answer these questions will surely move this field forward and potentially yield new therapeutic strategies for treating type 2 diabetes. We thank Drs. Adilson Guilherme, Joseph Virbasius and members of our laboratory at University of Massachusetts, Worcester, MA, USA for excellent discussion of the issues discussed in this review. Studies from our laboratory related to this topic are supported by grants to M. P. Czech from the National Institutes of Health (DK085753, DK030898) and from the International Research Alliance at the Novo Nordisk Foundation Center for Metabolic Research.